Let's walk through, step by step, what the Charity's EarthEye service can do. In some cases, like Dell's embrace of the program to monitor its subcontractors, the EarthEye GPS might seem legal. Dell announces in advance that the trackers will be used to monitor their contractors, and Dell presumably has signed contracts with those vendors that allows for such tracking. Presumably, Dell would legally engage its vendors if doubts emerged. Dell has not offered information about the program to vendors who pay Dell for access to that information. For all we know about the program, Dell may simply place trackers in obvious waste, like obsolete CRT televisions which only a fraudulent vendor would dump (domestically, like GES of Kentucky) or seek to export as waste. Now, let's set aside whether Dell's "strict no-export of e-waste policy" is a great thing or planned obsolescence infringing on the #righttorepair. If Dell pays a vendor to do X, the vendor's supposed to do that, and there's no evidence that Dell is threatening to go to the press with anything discovered. But that is different from what BAN did with MIT in the USA, and without MIT (who evidently withdrew support) in Canada and Europe. If the item tracked would not BE "waste" unless or until BAN poisoned it, it raises the specter if racketeering if BAN is selling that information for money. Here's a hypothetical. What if Dell's competitor, HP, hired BAN / EarthEye for something different. Suppose HP knows Dell has an upstream contractor in Penang, Malaysia, manufacturing the mercury lamp display devices Dell pairs with new desktops. Say they look (new) just like the ones Jim is photographing in Africa. What if HP asks BAN to go into Dell's upstream vendor's inventory, sabotage working backlights, install a GPS tracker, and monitor Dell's sales of computer displays to a large client in a 'third world' country.... Say, NNPC in Nigeria? NNPC - the Nigerian National Petroleum Corporation - is a giant wealthy conglomerate, the largest corporation in the most populated country in Africa. It purchases millions of dollars of brand new equipment from companies like Dell and HP every year. But let's say that BAN "obscures" the destination, and focuses on Nigeria unspecifically - the way BAN obscured the $500M state of the art e-waste recycling EcoPark in coverage of Hong Kong in the 2016 "Monitour" report. If HP then sent information claiming that Dell had shipped non-working equipment to Africa to the press, naming Dell and Dell's unwitting, unwilling, Penang contract manufacturer by name, and generating concern at NNPC about Dell's "shady practices", would that fit the definition of racketeering? Damn straight it would. And it would be a clear violation of the Lanham Act. The obvious purpose of the payments received by BAN for the GPS placement, the monetary interest of the "charity", and the interest in one OEM of sabotaging the reputation of a rival OEM, would all be prima facia evidence of criminal conduct. 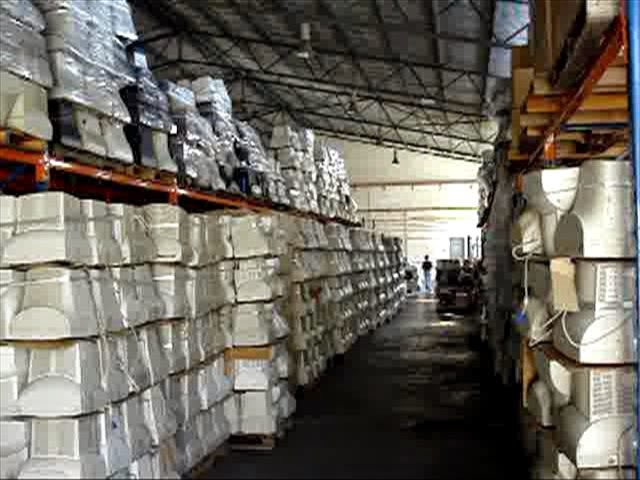 But BAN's GPS tracking reports failed in another sense - he hoped that they would re-establish the myth that a significant portion of e-waste is exported. USA showed 30%, Canada 15%, and Europe 5% - and THAT was only when BAN solely tracked nice equipment (0% in the CRT TVs which are most of the weight and most of the cost to recyclers). Jim likes to use the term "dirty little secret" in his press releases... If you actually follow the chain and see how BAN picked the device, BAN ruined the device, BAN places the device back in commerce, BAN makes money from the competitor AND from business owners who potentially get warned of BAN's tracking activity in advance, and BAN follows the device, chooses the pictures of the end user to display, hides evidence that the photo they use is atypical of practices in that country, and then asks for donations to help poor children (via poster child campaign) but never gives them a dime... This is a dirty big extortion racket. Let's look at the HP-BAN-Penang-Dell-NNPC example in 2018 context. BAN released a report to "frame" recycler practices in Canada. Or Joe Hurricane Benson's sales from UK hotel upgrades to African second hand shops. When a smaller business, like ERA in Canada, or BJ Electronics in Sussex, UK, have a viable business selling second hand display devices to middle class Africans, how is this different? The only thing that makes it different are BAN's false claims, seeded in dozens of journalism stories, that cause us to presume that Africans pay tens of thousands of dollars to buy, ship, and clear through customs junk worth hundreds of dollars in scrap. Who best to investigate this methodology? MIT's SenseAble City Lab disavowed any knowledge or complicity in the placement of GPS trackers on unwitting and unwilling subjects, and issued a statement that they only thing MoniTour Project did was demonstrate the GPS technology. All calls on the subject are now routed to MIT's legal offices. So my question is, why didn't journalists who initially reported on the MoniTour study, or the EarthEye program, ever follow up with MIT? Isn't it curious when a blogger like yours truly investigates the practice that MIT disavows the imprimatur BAN advertises? If reporters don't follow up on their stories which gave Basel Action Network credibility, causing a relentless cycle of false reporting about a false statistic generated to create a fake problem out of ordinary secondhand commerce, do they become part of the conspiracy, or just lazy? Well, reporters are busy people. The tradition of reporting that Basel Action Network is a respected Watchdog traces back to November 9, 2008, when CBS 60 Minutes released "Wasteland". Producer Solly Granatstein and his team won a Polk Award (Journalism prize) for it the following year. The producer emailed me during the airing, with a near apology, and offered to keep my suggestions in mind for the future. Alas, the 10 year anniversary has passed, and the gravitas imparted to the NGO's racket continues. BAN's claims of 80-90% dumping (not reuse) were circular and wrong. By allowing those false claims to stand, and not correcting BAN's false claims that the CRT monitors filmed in Hong Kong were being sent to Guiyu, the well was poisoned. 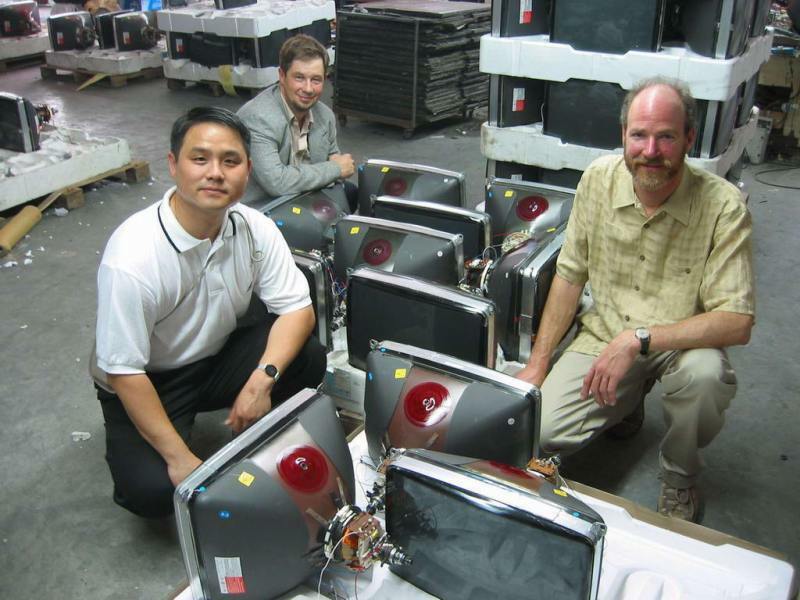 CBS had photographic evidence that I provided showing the factories which, I asserted, were importing the CRT monitors - for reuse. CBS did not disclose they were told otherwise - but won a journalism award. RACKETEERS OFFER A DECEITFUL SERVICE TO FIX A PROBLEM THAT OTHERWISE WOULDN'T EXIST. So rather than count on journalists - who are busy people chasing different stories every week - I have another proposal, in Part 5. We will publish the names of individual MIT students who participated in the placement of sabotaged electronics, containing GPS trackers, at sites in the Northeast. At least one of those sites we know is very much like the HP vs. Dell Penang analogy... the sabotaged device was not deposited at a public drop off, but walked into the private office of a nearby recycling non-profit... apparently by an MIT intern. Carlos Ratti's students have now presumably graduated, and have entered the workforce. My organization is may to pay them to testify, fly them to Africa if they so desire, and meet both with the Agbogbloshie scrappers BAN claims get the imported material, and the Tech Sector that imports it. We will fly them to Hong Kong's $550M Modern EcoPark facility, the one BAN obscured in the Monitour report, and failed to tell PBS about. We are offering to do for these well-intentioned participants the same thing we did for Craig Lorch at Total Reclaim when he testified on BAN's video. 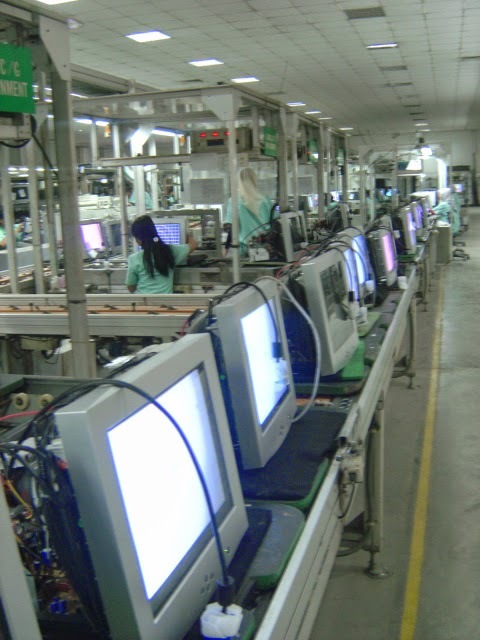 We provided CBS 60 Minutes photos from our tour with Craig of reuse factories in Guangdong Province - the ones we know imported the CRTs BAN claimed went to Guiyu. We led Craig Lorch and Jeff Zirkle of Total Reclaim to visit Dell's actual recycling contractor in Penang, Malaysia a decade ago. And I hope that when the MIT graduates see how they were led just as unwittingly as the Tech Sector importers into BAN's "framing" the exporters, that Jeff and Craig will think about doing the same. If you were a student of Carlo Ratti's during the BAN GPS tracking study, or volunteered or did work for BAN in placing the "ewaste", we have nothing to hide from you. In the next blog, you'll see a modest proposal. Like Total Reclaim (and Lin King of Univ California Davis / Berkeley) you can go check out BAN's "framing" of the e-waste issue for yourself. Contact me by email, via the blog, or by phone. We have a large number of Africa, Asia, and Latin America's Tech Sector, the best and brightest reuse technicians. Hear them out, make up your own mind, and whatever you think, we'll tell you perspective. We'll compare the Dell example, the HP-v-Dell hypothetical, the GPS device that tracked #joeHurricanebenson, those deployed with Bojan Paduh's ERA in Canada, and the devices sent to track my clients in Somerville. Together, we'll see whether this is product stewardship, or racketeering... and why MIT's ban on tracking unwitting and unwilling subjects, and involving compensated interested parties in joint studies, merits review.